Henry VIII’s birthday caused quite a stir last week when he and his first wife Catherine of Aragon were resurrected to tour the capital on the 527th anniversary of his birth. London has changed quite a bit since Henry’s day, so he was keen to stretch his legs, rediscover favourite spots, and greet loyal subjects. Afterwards, Henry and Catherine headed down to the Mary Rose Museum in Portsmouth for an afternoon of celebrations, birthday cake and an inspection of the Mary Rose herself. Henry and Catherine left St. James’s Palace, commissioned by Henry in 1531, to begin their royal birthday tour of the capital. Wearing his #HappyBirthdayHenryVIII sash, Catherine presented Henry with a present – a model of his beloved Mary Rose. 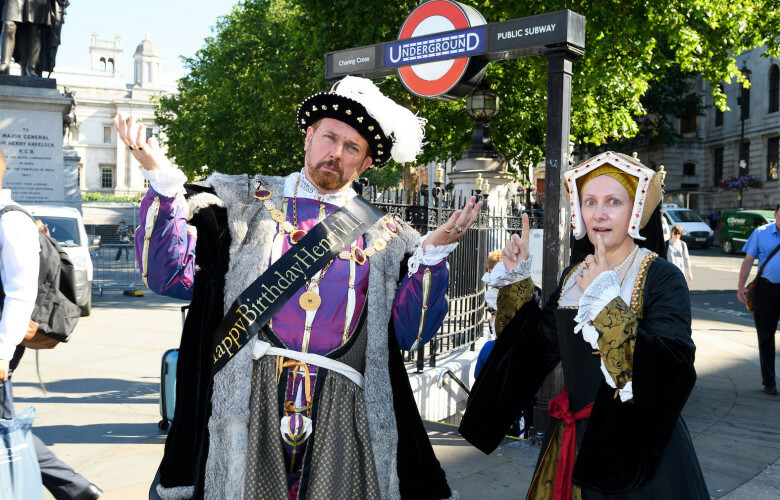 Following a flying visit to the National Portrait Gallery to check out the Tudor Family album, the royal couple hopped on the tube at Charing Cross, getting the District Line all the way to the Tower of London. On the way, Catherine couldn’t help but be distracted by the other Queens in the souvenir shop window. Although there were no Beefeaters to be found at the Tower, Henry spotted a dog he wouldn’t mind eating. Being an excitable fellow, Henry couldn’t wait to take his model Mary Rose out for a spin on the water. From the Tower, Henry and Catherine took their royal barge for a spin but had trouble using the strange seafood contraption to walk aboard. Henry had his eye caught, much to the annoyance of his wife. At Waterloo, there was enough time for Henry to pick up some commuter reading, waiting for the platform to be announced for his royal carriage. 90 minutes later, Henry and Catherine arrived in Portsmouth to see the King’s favourite warship, which he saw sink in the Solent during battle with the French Navy in 1545 and was only rediscovered and raised from the sea bed 400 years later. Welcomed by cheering crowds, the king cut cake, knighted subjects, toured the museum and scoured nearby Gunwharf Keys shopping outlet for bargains. Images © The Mary Rose Trust. Photography by Stephen Pover, except image 10 © Johnny Black. Image courtesy of The Mary Rose Trust.